by John D Souza (CED) on 30 and 31st July at at Thiruvengadu village in the Sirkali Taluk, Nagapattinam District, Tamil Nadu. 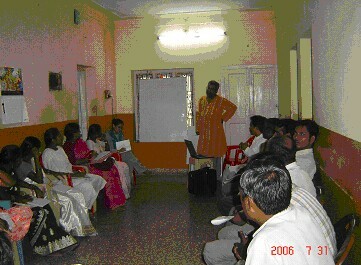 ISED staff that attended the session were from the three districts of Nagapattinam, Madurai and Trichy. The training was organized with a view to orient the people involved in the documentation and dissemination process at the local access point levels (LAPs) and build their capacities and competencies to address the wider issues of information exchange. The session began with introductions and discussion on Data, Information and Knowledge, the usage of these terms, their meaning and their significance. It continued with how different policies and events should be analysed with respect to viewpoints of government authorities, NGOs and private sector. Deeper discussions were held on the eight topics related to issues that ISED is involved in like: Livelihood in Tsunami affected families, Child Rights in the context of Tsunami, Corruption & Politics in Disaster Management, Social Security for Agricultural Labourers, Denial of Equal Political rights to Women, Denial of basic amenities to the rural poor , National Rural Employment Guarantee Act 2005 and Right to Information Act. The training also explained the usage of DOCPOST (an output of the RDC program) that is produced monthly and contains articles and clippings from national, regional and local newspapers for organizations working in habitat and rehabilitation.